Rated ☆☆☆☆☆ (5.0 out of 5) based on 24 reviews. Rated ☆☆☆☆☆ by Tony Van der Poel , South Africa on 3-Jan-2019 . Every stay has it's own memories. Rated ☆☆☆☆☆ by Eddie Vosloo, South Africa on 21-Aug-2018 . Rated ☆☆☆☆☆ by Julia Kuun, South Africa on 21-Aug-2018 . Tranquil nest is a lovely website under a canopy of trees. Our campsite was very private and the bathroom and kitchen were clean. The owners added extra touches like non-alcoholic champagne and biscuits as welcome gifts and little chocolates as well. As it is really close to the Kruger it was the perfect place to camp for us. The road was a little noisy but we found it didnt keep us awake at all.Good value for money! Rated ☆☆☆☆☆ by Charmaine Coetser, South Africa on 7-Aug-2018 . The camping facilities are definitely on a next level. Rated ☆☆☆☆☆ by Beyers Burger, South Africa on 11-Jul-2018 . Dis baie privaat en julle aandag aan details en klein bederfies maak alles ekstra spesiaal. Hi Ellen, ons het heerlik gekamp. Dis baie privaat en julle aandag aan details en klein bederfies maak alles ekstra spesiaal. Julle kampplek is baie goed uitgelÃª en prakties. Heerlike braaiplek en speelplek vir kinders. Die feit dat die werkers inkom om skottelgoed te was help dat mens waarlik kan ontdpan jou vakansie meer geniet. Ons sal julle beslis aanbeveel. Rated ☆☆☆☆☆ by Sollie Swanepoel, South Africa on 29-Jun-2018 . Rated ☆☆☆☆☆ by Charlotte Maila, South Africa on 23-May-2018 . It was truly lovely and service fantastic. Rated ☆☆☆☆☆ by Leandri Havenga , South Africa on 4-Feb-2018 . EXCELLENT SERVICE, BEAUTIFUL PLACE, VERY ROMANTIC AND SPOTLESS. Thank you very much! Will visit again and again. Rated ☆☆☆☆☆ by Chris Basson, South Africa on 2-Feb-2018 . Dit was die derde keer wat ons by julle gekuier het en dit voel of dit elke keer beter en beter word. Die verrassings soos die snyterye en sjjokelade elke dag was baie aangenaam. Die diens was puik en ons sal julle beslis weer besoek. Nogmals baie dankie. Rated ☆☆☆☆☆ by A M, South Africa on 10-May-2017 . Thank you for having us, our stay was beyond fantastic. Good day Ellen. Thank you for having us, our stay was beyond fantastic. The accommodation suited our needs and exceeded our expectations. The list of do's and dont's really helped alot. Our stay was comfortable and everything we needed was at hand (excepting a mop though). We truly had a great stay and the service was exceptional. You have a beautiful place there and i am sure that we will visit again in the near future. Thank you again for having us! Rated ☆☆☆☆☆ by Carol Dawes, South Africa on 4-Nov-2016 . Our Hosts Ellen and Chris were kindness itself! We had a wonderful stay of 10 days at Tranquil Nest. Bee Eater chalet was very well equipped,serviced everyday by competent friendly staff and the experience of dipping in the outdoor jacuzzi under the African night sky is not to be missed. Our Hosts Ellen and Chris were kindness itself, responded to any queries promptly and went the extra mile in helping us during an unfortunate accident. Thank you so much - hope to return in near future. Rated ☆☆☆☆☆ by Ellen Dry, South Africa on 31-Oct-2016 . We had a wonderful stay at tranquil nest. We had a wonderful stay at tranquil nest. The place was very clean and was cleaned every day. Your personnel were very friendly and helpfull - espescially Christof who assisted us in putting up the caravan. What was exceptional were the little things such as the welcoming bottle of grape juice and the cookies/biscuits and evening chocolate every day that made this an experience to be remembered for the rest of our lives. thank you and your friendly personnel for the special care. Rating 10 /10. Rated ☆☆☆☆☆ by Colin Tedder, South Africa on 31-May-2016 . Thank you so very much for all you did to make our time at Tranquil Rest so enjoyable. Thank you so very much for all you did to make our time at Tranquil Rest so enjoyable. The rose looked so lovely on our table - wonderfully romantic! The Sunday paper was such a fun thing to do as was eating all the chocolate! Rated ☆☆☆☆☆ by Joey ., South Africa on 10-Feb-2016 . We had such a nice time staying at Bee eater chalet. Thank you for the clean & neat chalet. We had such a nice time staying at Bee eater chalet. On arrival even the table were set for us, we could basically really just relax. And thank you Ellen for Junior's 10th birthday gift. He was so surprised. Will see you again. Rated ☆☆☆☆☆ by Robbie Young, South Africa on 8-Jan-2016 . The service, site and whatever you had to offer was "TOP NOTCH". Firstly, I would like to thank you for a most wonderful stay at Tranquil Nest. The service, site and whatever you had to offer was "TOP NOTCH". We were at no time bothered with the traffic and slept exceptionally well each night. Your place comes highly recommended and we have already told many friends and family about the holiday. You can be assured that we will be back, most probably with a crowd, so be prepared. Secondly, Chris, thank you so much for helping out with my trailer. We managed to get home safely and I have since then sent the trailer in for a full service. You were a life saver. Should I have time, now that I am back at work, I will do my utmost to write to the SA Caravan magazine and compliment your resort. I dearly hope they publish it. Until next time, have a wonderful 2016. Warm regards. Rated ☆☆☆☆☆ by Johan & Ria, South Africa on 23-Oct-2015 . Baie dankie vir al julle gasvryheid en vriendelikheid. Baie dankie vir al julle gasvryheid en vriendelikheid. Chris, Ellen, personeel en sekuriteit, ons het lekker gekamp by julle. Die natuur en rustigheid en alles wat ons nodig gehad het in kamp gerief het ons by julle gekry. Sal verseker weer daar kom kamp wanneer ons in daardie rigting beweeg. Julle is tops!!!! Rated ☆☆☆☆☆ by Frik Grobler, South Africa on 6-Oct-2015 . Thank you for all the effort in making the best stand we ever been at. We arrived late, and in the rain. Still, the security guard was very helpful, running in the rain to help us to our site, and with getting the caravan positioned. The bathroom and kitchen facilities were exceptional. so much better than what we expected! The well looked after stand, garden, lawn and braai facilities made the stay too short. Even braai utensils being supplied is a small touch that made the stay exceptional. Friendly and efficient personnel also made the stay unforgettable. Thank you for all the effort in making the best stand we ever been at. Rated ☆☆☆☆☆ by Natasha Paterson, South Africa on 18-Aug-2015 . We had such a lovely, restful time at Tranquil nest. Thank you so much for the discount, that was a lovely surprise. We had such a lovely, restful time at Tranquil nest. The accommodation was so lovely and comfortable. Your staff was so friendly and did such a wonderful job of keeping the units clean and tidy! We will definitely we visiting you again. Rated ☆☆☆☆☆ by Anria van Rooyen, South Africa on 7-Apr-2015 . Ons kan nie wag om weer te kom nie!! Ons het die aand by jul so geniet! Die chalet is pragtig, die uitsig so mooi en die "personal touches" maak dit ekstra spesiaal!! Ons kan nie wag om weer te kom nie!! Rated ☆☆☆☆☆ by Eloise X, South Africa on 30-Sep-2014 . ....it made us feel very special. My fellow guests were absolutely delighted in the personalised details received on arrival. The facility was spotless and all our needs were fulfilled. What I enjoyed most was the privacy, you see and hear no guests or staff and I felt very safe. Thank you for following up continuously it made us feel very special. Rated ☆☆☆☆☆ by Wayne Bischoff, South Africa on 8-Sep-2014 . Super clean, wonderful hot tub which the kids loved, and great luxury. The visiting zebras were cool. Nice and close to everything. Rated ☆☆☆☆☆ by Mandie van Rensburg, South Africa on 6-May-2014 . Baie dankie vir skoon, netjiese en praktiese omgewing. Baie dankie vir skoon, netjiese en praktiese omgewing. Dankie ook aan die persoonlike "touch" deur eienaars. Rated ☆☆☆☆☆ by Adamante Wiid, South Africa on 13-Dec-2013 . Baie skoon , baie gerieflik , baie vriedelike staf ! Alles wat jy nodig het en nog meer ! Uitmuntende eienaars wat dit soos familie laat voel Baie dankie , Ellen , my kinders het dit so geniet en sal verseker weer kom Baie liefde en groot seen vir 2014 ! Rated ☆☆☆☆☆ by David and Cecilia Hey, South Africa on 10-May-2013 . What a very well maintained spotlessly clean peaceful caravan park. What a very well maintained spotlessly clean peaceful caravan park. A very well positioned park close to the Kruger National Park, Gods Window,The Three Rondavels and other attractions in the area. This caravan park is managed and run by a very professional dedicated couple who go the extra mile to ensure your comfort and the good night chocolate and the very thoughtful padkos bag containing delicious rusks,snack bars and chocolate just added to the very pleasant stay at Tranquil Nest. WE WILL BE BACK. 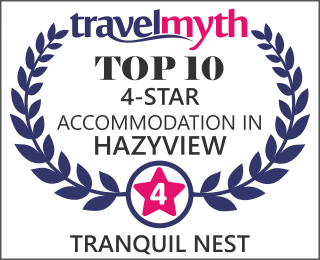 Tranquil Nest is an Afristay Valued Member.